[dropcap style=”font-size: 60px; color: #9b9b9b;”]T[/dropcap]he human arm can perform a wide range of extremely delicate and coordinated movements, from turning a key in a lock to gently stroking a puppy’s fur. The robotic “arms” on underwater research submarines, however, are hard, jerky, and lack the finesse to be able to reach and interact with creatures like jellyfish or octopuses without damaging them. Previously, the Wyss Institute for Biologically Inspired Engineering at Harvard University and collaborators developed a range of soft robotic grippers to more safely handle delicate sea life, but those gripping devices still relied on hard, robotic submarine arms that made it difficult to maneuver them into various positions in the water. Now, a new system built by scientists at the Wyss Institute, Harvard’s John A. Paulson School of Engineering and Applied Sciences (SEAS), Baruch College, and the University of Rhode Island (URI) uses a glove equipped with wireless soft sensors to control a modular, soft robotic “arm” that can flex and move with unprecedented dexterity to grasp and sample delicate aquatic life. This system could one day enable the creation of submarine-based research labs where all the delicate tasks scientists do in a land-based laboratory could be done at the bottom of the ocean. Insights from this work could potentially have value for medical device applications as well. The research is published in Scientific Reports. “This new soft robotic arm replaces the hard, rigid arms that come standard on most submersibles, enabling our soft robotic grippers to reach and interact with sea life with much greater ease across a variety of environments and allowing us to explore parts of the ocean that are currently understudied,” said first author Brennan Phillips, Ph.D., an Assistant Professor at URI who was a Postdoctoral Fellow at the Wyss Institute and SEAS when the research was completed. The arm is controlled wirelessly via a glove equipped with soft sensors that is worn by a scientist, who controls the arm’s bending and rotating by moving their wrist and the grippers by curling their index finger. Those movements are translated into the opening and closing of various valves in the system’s seawater-powered hydraulic engine. Different types of soft grippers can be attached to the end of the arm to allow it to interact with creatures of varying shape, size, and delicacy, from hard, brittle corals to soft, diaphanous jellyfish. 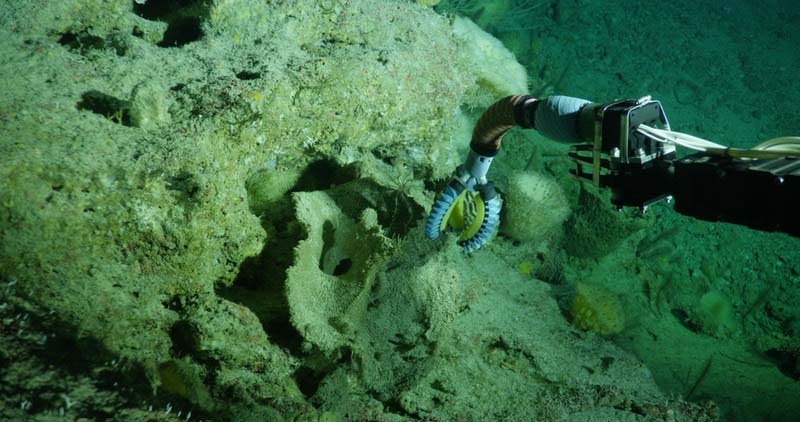 The robotic arm and gripper system was field-tested from a 3-person submarine in the unexplored deep-sea ecosystems of Fernando de Noronha Archipelago, Brazil. It was successfully able to interact with or collect delicate mid-water and deep-sea organisms like a glass sponge, a sea cucumber, a branching coral, and free-floating bioluminescent tunicates. Different modules were quickly and easily swapped into the arm in order to better maneuver the grippers to reach its target organism, or in the case of any one module being damaged, without needing to dismantle the entire arm. “This low-power, glove-controlled soft robot was designed with the future marine biologist in mind, who will be able to conduct science well beyond the limits of SCUBA with comparable or better means than via a human diver,” said Robert Wood, Ph.D., a senior author of the paper who is a Founding Core Faculty member of the Wyss Institute as well as the Charles River Professor of Engineering and Applied Sciences at SEAS. The researchers are continuing to refine their designs and are incorporating non-invasive DNA and RNA sampling capabilities into the actuating units of the arm system, with the goal of being able to capture fragile sea life, perform a series of experiments in an “underwater laboratory,” and release them unharmed. “The Wyss Institute’s goal is to get scientific discoveries out of the lab and into the world, but sometimes we have to figure out how to modify the scientific laboratory itself so that it can be moved out of academia in order to be able to probe real-world environments. This research marks the beginning of that possibility for the deep sea, and the advances they describe could have much broader value, even for medical and surgical applications,” said Donald Ingber, M.D., Ph.D., the Founding Director of the Wyss Institute who is also the Judah Folkman Professor of Vascular Biology at HMS and the Vascular Biology Program at Boston Children’s Hospital, and Professor of Bioengineering at SEAS. Are robots putting us out of work or creating work opportunities?